Meteor is getting more and more popular these days. Creating a web application is so easy. But what can we do if we want to push live our great project? Unfortunately, there are not too many deployment tools available (yet?). In this article I’m going to explain step by step how to release your Meteor application to debian/ubuntu system (apt-get command required). Now we can start installing required software on our server. Mongodb is not required for Meteor app, but it’s highly recommended - we need to store data somewhere, right? ssh deploy@example.com "mkdir -p /home/deploy/www/example"
ssh deploy@example.com "cd /home/deploy/www/example && tar xfz example.tar.gz"
It will take a minute or two. Warnings can be ignored here. ssh deploy@example.com "mkdir -p /home/deploy/www/example/bundle/tmp /home/deploy/www/example/bundle/public"
ssh deploy@example.com "cd /home/deploy/www/example && touch bundle/tmp/restart.txt"
Your Meteor application should be up and running now. Go to http://example.com to check it. ssh $REMOTE "mkdir -p $DIR"
This script can be placed in your meter app in main directory. Also, It is highly recommended to upload your public ssh key for deploy user. Otherwise we will have to type password a few times. That’s all. We can use this command every time we need to deploy new release. 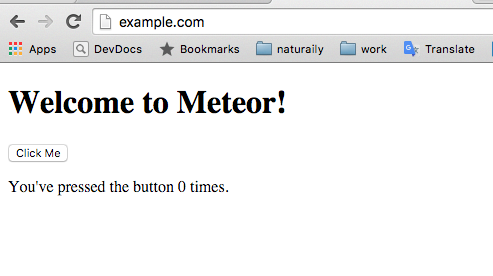 Deploying Meteor app with nginx and passenger is quite easy. The great thing is that we don’t have to worry about restarting node process after deployment or app crash. Passenger process will do it for us. Also, the bash script is not perfect, but it’s a good place to start. It would be great to display some progress messages and handle errors better. But this is something to be taken care of later.